This is our living room. It's not the most elegant living room, but it works for us. (If you haven't read other posts about our home, please know we live in a very old (1890s) Victorian style home.) 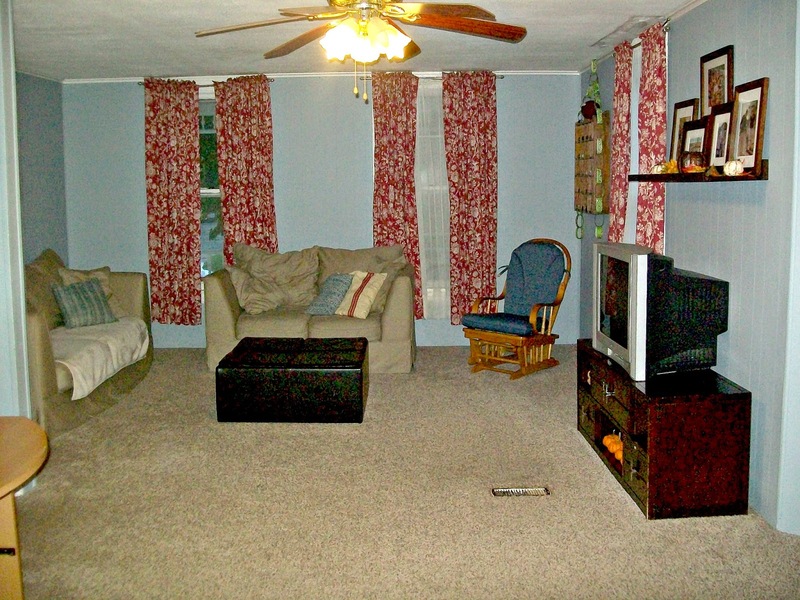 You'll notice no end tables, coffee tables, and/or table lamps. Some of the curtain rods are bent and sheer curtains missing. This is a result of having two sensory seeking kiddos for whom safety is not always the first priority. What Bulldozer didn't teach us, Sunshine has. There are two sections to our living room. The picture below shows our seating area. In this picture, one ottoman lid is completely off exposing blanket storage. Another lid is half way off. Another is turned over to expose the table. The last lid is in seat position. 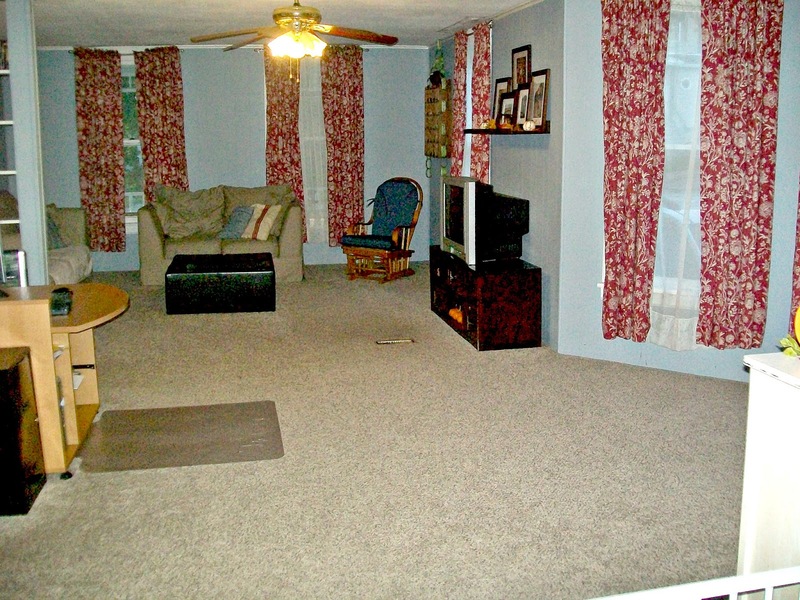 The picture below shows our work and play area. I'm writing this post at the computer desk in the picture. Right by the computer desk is the entrance to our learning time room. (In case you were wondering.) The dresser is home to all of our play dough supplies, paint & brushes, stamps & ink, and puzzles. The knobs from all of the drawers have been removed so Sunshine can't get into them. The storage unit in the corner is home to board games among other things. I'm sure you can notice from these pictures I'm a very simple person who does not like clutter. 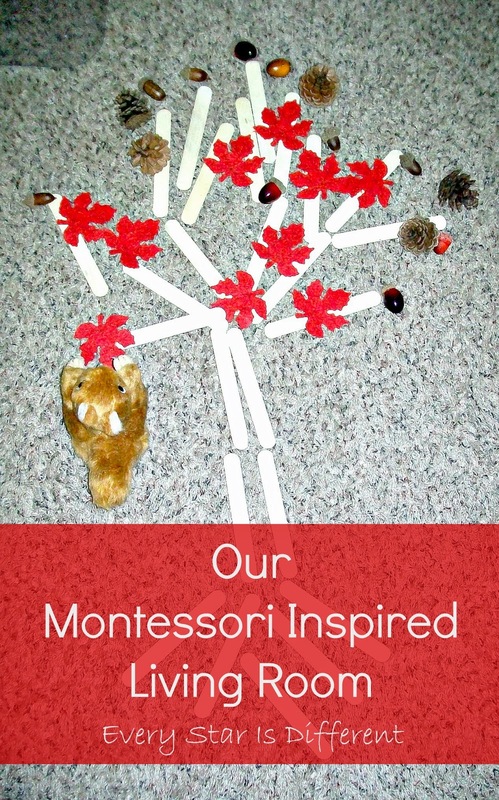 My attitudes do not change when it comes to anything Montessori. I'm a firm believer in using what you have. When I feel the need to purchase more shelves or other furniture items to organize a room, I know I either have too many things or I'm not utilizing the space I have already. As I designed our Montessori inspired living room, I kept this idea in mind. 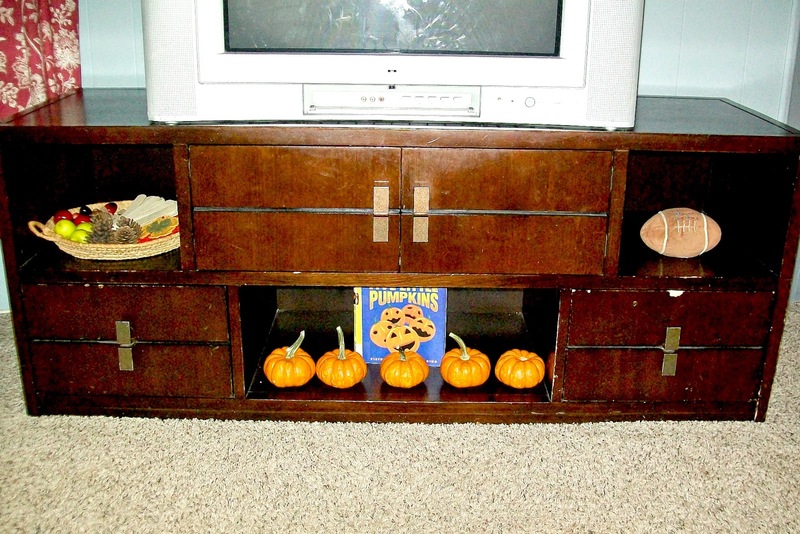 One of the first places I noticed I had space and shelving for activities was our TV stand. Due to several infants and toddlers in our home for the past 7 years, the stand has never been home to books, decor, or anything else. 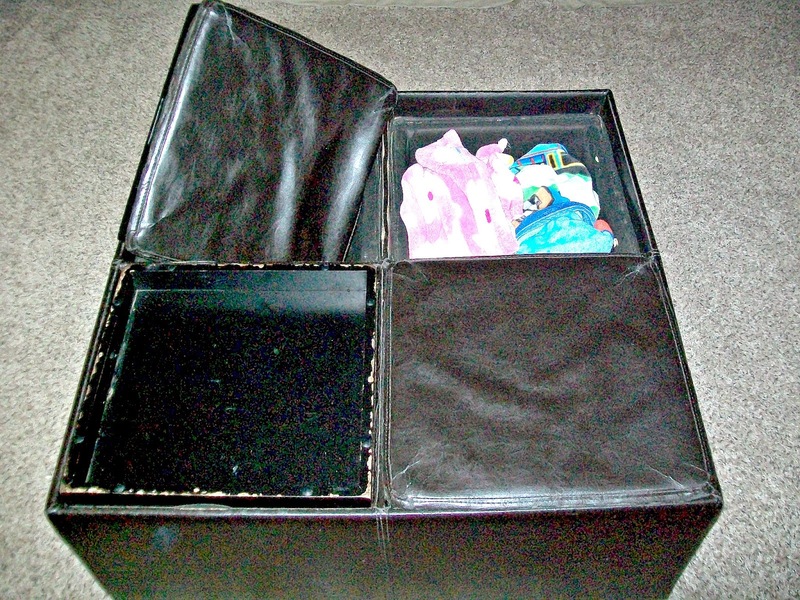 However, we've found it's a perfect place to store a few activities and/or toys. I'm sure you can see the wear and tear of little hands. 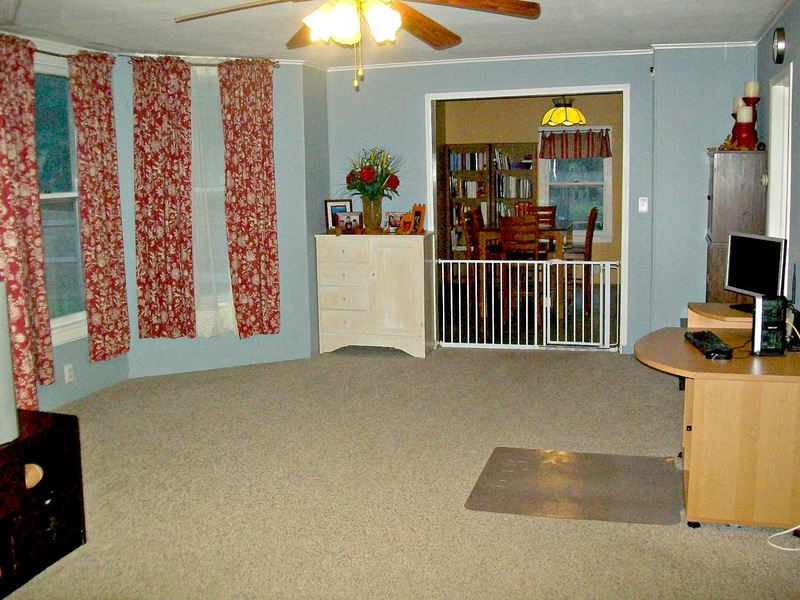 The closing doors store our DVD player, right where the kiddos can learn to use it themselves. The pull out drawers underneath are empty. Sunshine loves to put things in and out of everything she can. These drawers are perfect for her to practice her skills. I don't purchase new items for activities in the living room or dining room. If I want books I get them through our local library exchange. All other materials are usually toys the kiddos already have, or manipulatives I've used in past units. The second set of shelves for activities is in the corner of the room, next to the learning time room entrance (where we also store board games). These shelves had been used for books. However, I'm not one to read a book twice, unless it's REALLY good or a FABULOUS resource. I realized there was no point in keeping most of the books on the shelves. They look much better as Montessori shelves anyways. On these shelves you'll find four different toys or sets of toys that either have a learning or practical life component to them. Right now the shelves hold a baby doll with her diaper bag, fully equipped with a diaper, "wipes," bib, & bottle. Sunshine is struggling with diaper changes and eating, so I'm hoping this activity will help her feel more comfortable with these tasks. Another shelf holds Sunshine's camera. She's been watching Mommy take lots of pictures lately and wants to join in on the fun. One bottom shelf holds a set of parent and baby farm animals. The other holds a LEGO duplo store set. 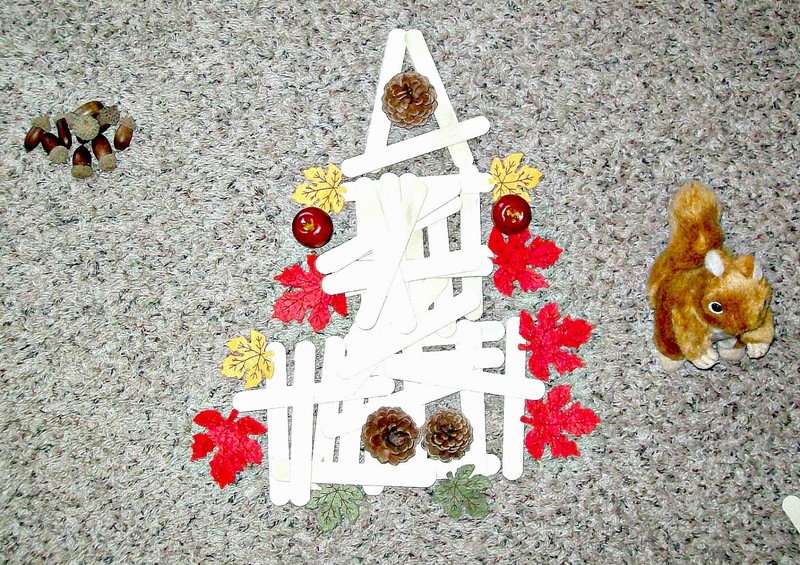 This is a great activity to help Sunshine with her fine motor skills. (Putting LEGO duplos together requires lots of skill.) I have chosen not to use trays because Sunshine tends to destroy them. When she's older, I'm hoping she grows out of this. 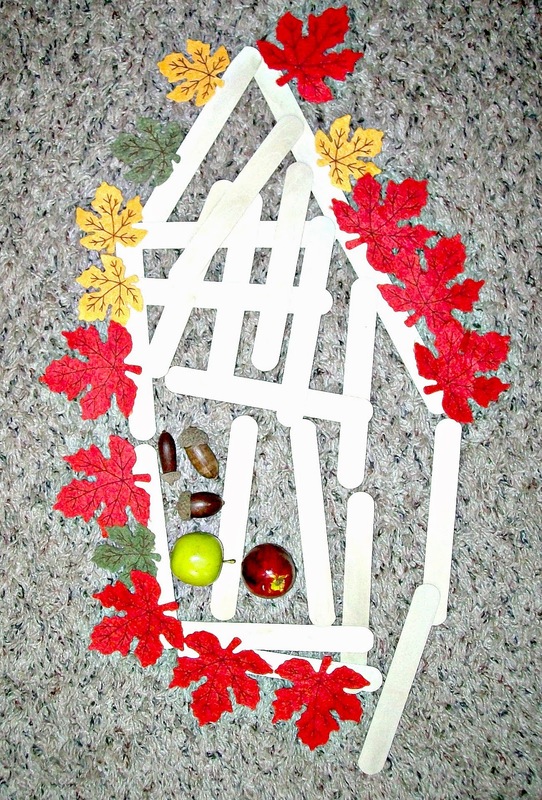 I couldn't resist showing you my toddler friendly Fall Invitation to Play. 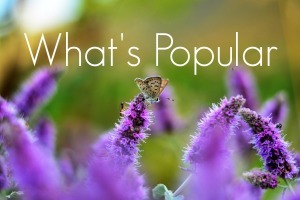 It's been a HUGE hit. 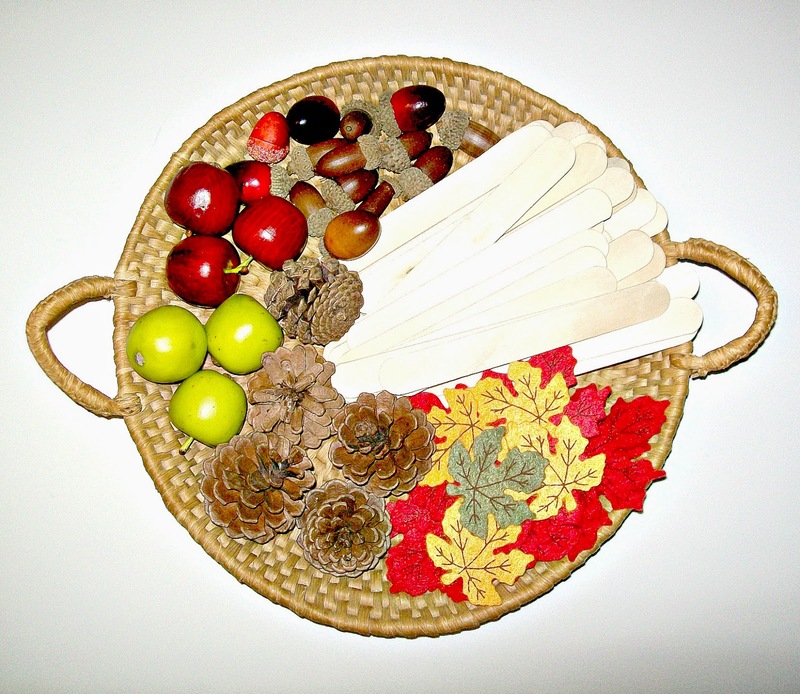 The basket (which is soft and very hard to break), holds tongue depressors, felt leaves, pine cones, plastic apples, and acorns. 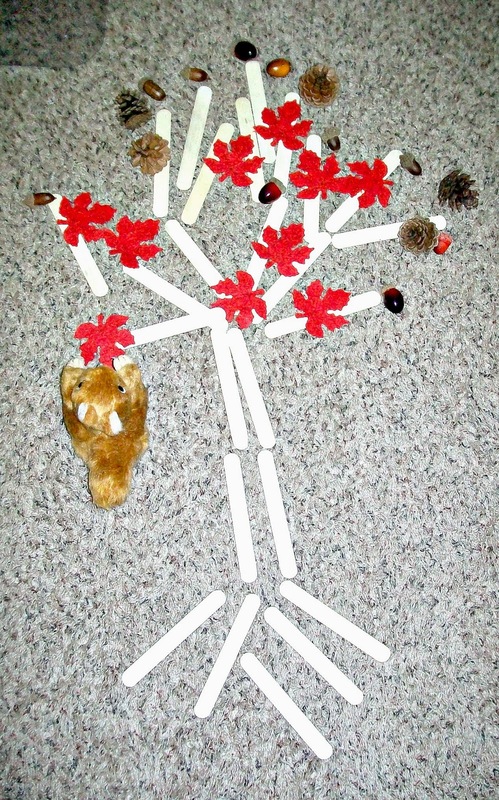 I introduced the activity by making a tree with all of the materials. Today, Dinomite created his own. I must say, his was much better than mine. I love how he made roots. Bulldozer has built several houses. I do believe they're houses for the squirrel. Princess has even joined the fun creating houses of her own. I love how she decorated hers with leaves. I love applying Montessori principles into our daily living and home life. Usually, we find that we already have the materials and space to do so, if we just take a minute to look, and possibly rearrange a little. Creating a Montessori home does not need to be expensive. If you're starting from scratch and have no furniture at all, then you may have to spend some money, but otherwise, it should literally cost you pennies if anything. I'm always amazed at the change in the environment when I turn another room into a Montessori inspired one. It's so worth it! Such a perfect and practical way to create space for children at home! 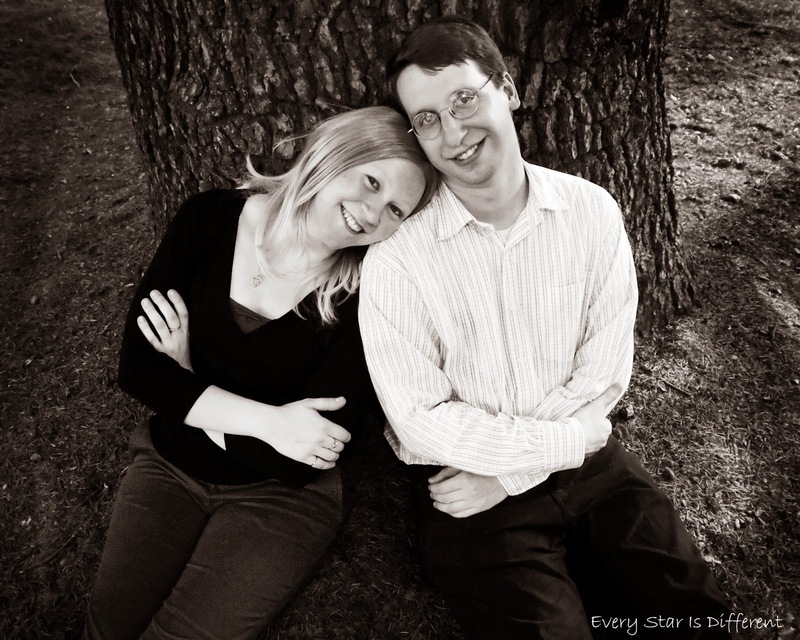 Thank you for sharing your ideas with us!